Kelly Callahan was 8 years old when she unwittingly charted her life's course. "I was sitting under the dining table with my neighbor's dog, listening to my mother's conversation about Liberia," Callahan said. "I thought, 'Yeah - I'm going to go there.' And from then on, I always knew I would go to Africa. I just didn't know why or for what." Nineteen years later, Callahan finally made that trip to Africa, and she never looked back. Starting as a U.S. Peace Corps volunteer and eventually joining The Carter Center in South Sudan, she spent the next five years on the continent working to eradicate Guinea worm, a parasitic disease that persists in remote areas with no access to clean water. These days, Callahan's home base is Carter Center headquarters in Atlanta, where she directs the Trachoma Control Program, but her passport stays close. Last year she visited 10 countries in six months, including four nations where the Center is working to eliminate blinding trachoma, a bacterial eye disease. "I knew I wanted to dedicate a chunk of my life to either helping animals or people," Callahan said. In college she spent three summers in British Columbia studying killer whales. In her late 20s, she applied for the Peace Corps. For her Peace Corps assignment in Cote d'Ivoire, she started working on Guinea worm disease "within 10 minutes of arriving in my village," she said. The Peace Corps was placing volunteers in areas highly affected with Guinea worm disease. She was the first of two to be placed in highly endemic areas in Cote d'Ivoire. After two successful years, Callahan was asked to join the Carter Center team in South Sudan. She found herself living in Kenya at a U.N. base camp of canvas tents. Due to safety concerns and logistics, all nongovernmental organizations serving South Sudan were based in Kenya. Callahan was able to go into South Sudan for just a few weeks at a time. "It was the toughest job I've ever had," Callahan said. Because the South Sudanese populations were highly mobile, Callahan and others hatched a plan to manufacture and distribute portable personal pipe filters that could be worn around the neck. Within six months massive air cargo planes were disbursing 9.29 million pipe filters across Sudan. "At the time, it was the largest public health intervention that had ever been attempted," Callahan said. After more than five years in South Sudan, Callahan returned to the states, taking a job as assistant director of program support at The Carter Center. In this role, she did whatever was needed to help the Carter Center's field offices run as smoothly as possible. "One day I would be working on a contract, the next I was purchasing vehicles for Mali, and the next I would be trying to get a consultant who tore his aorta out of South Sudan and into South Africa within hours for treatment," Callahan said. 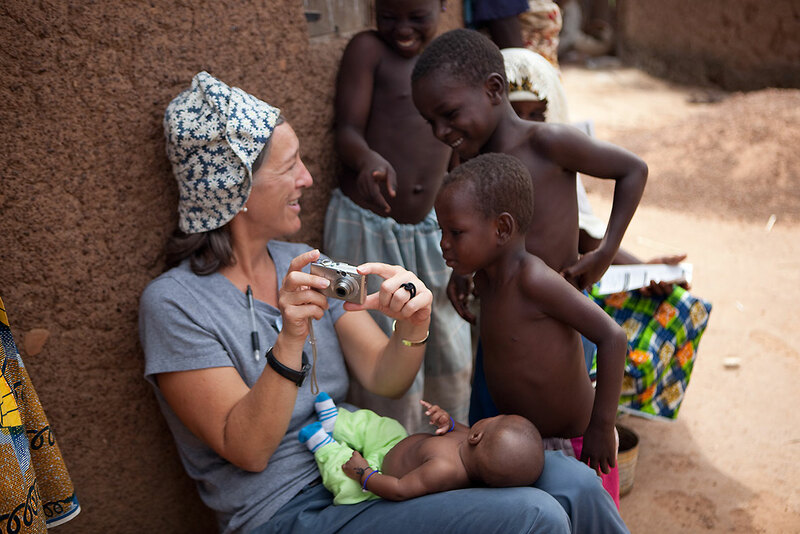 After 10 years, Callahan was ready for a new challenge, and last spring she was named director of the Center's trachoma program. "When I look at the maps of active trachoma prevalence, we have made significant progress over the years," Callahan said. Her goal is to increase the work to prevent the long-term, recurring trachoma infections that can lead to blindness: educating people on facial cleanliness, which keeps the flies that spread the disease away, and environmental improvement, which involves building latrines to reduce the fly population. In Ethiopia recently in an area with Carter Center services, Callahan visited a camp where free eyelid surgery is provided to correct the painful in-turned eyelashes that result from years of repeated trachoma infections. "A grandmother was holding her grandchild while the mother had surgery on both eyes," she said. "It perfectly represented past, current, and future. In the past we had performed surgery on the grandmother. Currently we were taking care of the mother. And the child should not need surgery in the future."